Matthew Rosenberg and Carlotta Gall, “Prisoner Trade Yields Rare View Into the Taliban,” New York Times, June 1, 2014, https://www.nytimes.com/2014/06/02/world/asia/soldier-prisoner-trade-for-five-taliban-figures-offers-rare-view.html. Mazloom is also wanted by the United Nations for possible war crimes and stands accused of administering a series of massacres targeting Shiite and Tajik Sunnis Muslims in central and northern Afghanistan.Matthew Rosenberg and Carlotta Gall, “Prisoner Trade Yields Rare View Into the Taliban,” New York Times, June 1, 2014, https://www.nytimes.com/2014/06/02/world/asia/soldier-prisoner-trade-for-five-taliban-figures-offers-rare-view.html. Mazloom was captured by the anti-Taliban Northern Alliance in November 2001 and detained in the U.S. Guantanamo Bay detention center from January 2002 to May 2014.“S E C R E T / / NOFORN / / 20330223,” U.S. Department of Defense, February 23, 2008, http://media.miamiherald.com/static/images/escenic-images/gitmopdfs/us9af-000007dp.pdf. He was one of five Taliban senior leaders transferred to Qatar as part of the Qatar-mediated exchange for captive U.S. Sgt. Bowe Bergdahl.“Report on the Inquiry into: The Department of Defense’s May 2014 Transfer to Qatar of five law-of-war detainees in connection with the recovery of a captive U.S. soldier,” Committee on Armed Services, December 9, 2015, https://armedservices.house.gov/sites/republicans.armedservices.house.gov/files/wysiwyg_uploaded/Report%20on%20the%20Inquiry%20into%20the%20Taliban%20Five%20Transfer_0.pdf. According to a December 2015 report by the Committee on Armed Services, the U.S. intelligence community determined that Mazloom was “an influential Taliban leader” who had developed “close ties” with the Taliban’s senior leaders.ldquo;Report on the Inquiry into: The Department of Defense’s May 2014 Transfer to Qatar of five law-of-war detainees in connection with the recovery of a captive U.S. soldier,” Committee on Armed Services, December 9, 2015, https://armedservices.house.gov/sites/republicans.armedservices.house.gov/files/wysiwyg_uploaded/Report%20on%20the%20Inquiry%20into%20the%20Taliban%20Five%20Transfer_0.pdf. Among others, Mazloom was an associate of former Taliban emir (leader) Mullah Omar.“S E C R E T / / NOFORN / / 20330223,” U.S. Department of Defense, February 23, 2008, http://media.miamiherald.com/static/images/escenic-images/gitmopdfs/us9af-000007dp.pdf. In 2013, the U.S. National Intelligence Council determined that Mazloom would “probably [again]… become an effective and influential military leader” if he were able to return to Afghanistan and operate freely.“Report on the Inquiry into: The Department of Defense’s May 2014 Transfer to Qatar of five law-of-war detainees in connection with the recovery of a captive U.S. soldier,” Committee on Armed Services, December 9, 2015, https://armedservices.house.gov/sites/republicans.armedservices.house.gov/files/wysiwyg_uploaded/Report%20on%20the%20Inquiry%20into%20the%20Taliban%20Five%20Transfer_0.pdf. On May 31, 2014, Mazloom was transferred from the U.S. detention center in Guantanamo Bay to Qatar alongside four other Taliban detainees. The move came as part of a negotiated exchange for the release of U.S. captive soldier Sgt. Bowe Bergdahl. At the time of the their transfer, the so-called Taliban Five—including Mazloom—were considered to be sufficiently dangerous as to require them to remain in detention.“Report on the Inquiry into: The Department of Defense’s May 2014 Transfer to Qatar of five law-of-war detainees in connection with the recovery of a captive U.S. soldier,” Committee on Armed Services, December 9, 2015, https://armedservices.house.gov/sites/republicans.armedservices.house.gov/files/wysiwyg_uploaded/Report%20on%20the%20Inquiry%20into%20the%20Taliban%20Five%20Transfer_0.pdf. Although the Memorandum of Understanding (MOU) between the United States and Qatar was classified regarding the terms for Taliban detainees released to Qatar, the U.S. Armed Forces Committee was able to note that the MOU specified “monitoring” efforts to be undertaken by Qatar, as well as the prohibition against detainees’ “travel outside Qatar,” “engaging in conduct that will raise money for prohibited causes,” and “threatening American interests.”“Report on the Inquiry into: The Department of Defense’s May 2014 Transfer to Qatar of five law-of-war detainees in connection with the recovery of a captive U.S. soldier,” Committee on Armed Services, December 9, 2015, 76, https://armedservices.house.gov/sites/republicans.armedservices.house.gov/files/wysiwyg_uploaded/Report%20on%20the%20Inquiry%20into%20the%20Taliban%20Five%20Transfer_0.pdf. As of 2015, Taliban leaders were reportedly living in an exclusive neighborhood in suburban Doha, receiving luxury SUVs, free medical care, air-conditioned homes “the size of small castles,” and fresh produce delivered daily to their homes, according to a report by Newsweek journalist Sami Yousafzai.Sami Yousafzai, “Taliban Leaders Are Living in Luxury in Qatar,” Newsweek, March 24, 2015, http://www.newsweek.com/2015/04/03/taliban-leaders-are-living-luxury-qatar-316122.html. Senior Taliban leaders reportedly believed at the time that Mazloom should replace then-leader of the Taliban Mullah Mansour. One senior Taliban commander said that members of Mansour’s circle, in an effort to stave off a power struggle, had told Western officials that Fazl was likely to join ISIS if allowed to leave Qatar.Sami Yousafzai, “Taliban Leaders Are Living in Luxury in Qatar,” Newsweek, March 24, 2015, http://www.newsweek.com/2015/04/03/taliban-leaders-are-living-luxury-qatar-316122.html. Fazel Mohammad Mazloom“Consolidated United Nations Security Council Sanctions List,” U.N. Security Council, accessed December 23, 2016, https://www.un.org/sc/suborg/en/sanctions/un-sc-consolidated-list#individuals. Haji Fazl Akhund“S E C R E T / / NOFORN / / 20330223,” U.S. Department of Defense, February 23, 2008, http://media.miamiherald.com/static/images/escenic-images/gitmopdfs/us9af-000007dp.pdf. Mohammad A Fazl“S E C R E T / / NOFORN / / 20330223,” U.S. Department of Defense, February 23, 2008, http://media.miamiherald.com/static/images/escenic-images/gitmopdfs/us9af-000007dp.pdf. Molah Fazl“Consolidated United Nations Security Council Sanctions List,” U.N. Security Council, accessed December 23, 2016, https://www.un.org/sc/suborg/en/sanctions/un-sc-consolidated-list#individuals. 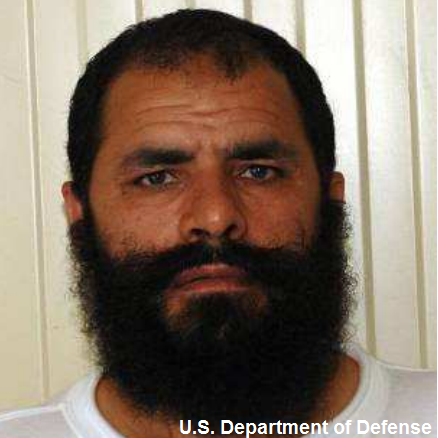 Mullah Fazl Ahmad“S E C R E T / / NOFORN / / 20330223,” U.S. Department of Defense, February 23, 2008, http://media.miamiherald.com/static/images/escenic-images/gitmopdfs/us9af-000007dp.pdf. Mullah Fazl AkhundSami Yousafzai, “Taliban Leaders Are Living in Luxury in Qatar,” Newsweek, March 24, 2015, http://www.newsweek.com/2015/04/03/taliban-leaders-are-living-luxury-qatar-316122.html. Mullah Fazel MazloomMatthew Rosenberg and Carlotta Gall, “Prisoner Trade Yields Rare View Into the Taliban,” New York Times, June 1, 2014, https://www.nytimes.com/2014/06/02/world/asia/soldier-prisoner-trade-for-five-taliban-figures-offers-rare-view.html. Mullah Fazl Mazloom“S E C R E T / / NOFORN / / 20330223,” U.S. Department of Defense, February 23, 2008, http://media.miamiherald.com/static/images/escenic-images/gitmopdfs/us9af-000007dp.pdf. Mullah Mohammad FazlMatthew Rosenberg and Carlotta Gall, “Prisoner Trade Yields Rare View Into the Taliban,” New York Times, June 1, 2014, https://www.nytimes.com/2014/06/02/world/asia/soldier-prisoner-trade-for-five-taliban-figures-offers-rare-view.html. The United Nations sanctioned Fazl Mohammad Mazloom as an individual associated with the Taliban.“Consolidated United Nations Security Council Sanctions List,” U.N. Security Council, accessed December 28, 2016, https://www.un.org/sc/suborg/en/sanctions/un-sc-consolidated-list. Fazl Mohammad Mazloom is a U.N.-sanctioned Taliban senior leader based in Qatar.